When I moved to the U.S. at the age of 7 from Teheran, I could speak, read, and write Armenian, Farsi, and a good amount of French. But I didn't know any English. I did have access to television, though, and over the course of a summer of watching "Brady Bunch" and "Happy Days," I picked up enough English to get around. 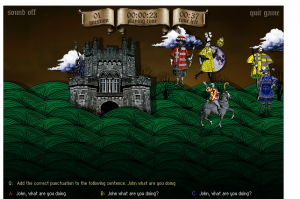 English language learners have many more tools at their disposal these days, and teacher Larry Ferlazzo has released his annual Best Online Games for them. - Whack Attack is a game from the BBC that tests knowledge on Math, English or Science. It’s probably accessible to Intermediate English Language Learners. The questions are good, though the game is a little weird. You’re given three answer choices. Each answer is color-coded, and in order to choose an answer, you have to “whack” the correctly-colored figure that keeps popping up. - Darwin's Footsteps: simple and interactive game about Charles Darwin and his discoveries. It’s accessible to Early Intermediate English Language Learners. - If you’ve ever wanted to be a dragon, Choice of the Dragon is the game for you. You get to be one — as nice or as mean as you want! It’s “choose your own adventure game” and makes for very engaging reading. I wouldn’t say the content is particularly educational, but reading is learning! It’s accessible to Intermediate ELL’s. - Jeopardy Labs lets teachers and students create their own online games of Jeopardy. No registration is required, and each game has its own unique url address. Most other apps to create Jeopardy games require a software download, which makes Jeopardy Labs really stand-out since none is required. It must be noted that these games can be useful for any type of learner -- not just those learning English as a second language. I may have to give some of these a try with my second-grader.